CSIR UGC NET Exam June 2019 Results declared, check it here. CSIR results: The Council of Scientific and Industrial Research (CSIR) has declared the results of Joint CSIR-UGC NET test for junior research fellowship (JRF) and eligibility for lectureship (NET) on its official website. Successful candidates can avail the fellowship from July 1, 2019. Click here to check your results for the exam that was conducted on December 16, 2019. Take a printout of the PDF page containing the results and save it on your computer for future reference. The Council of Scientific & Industrial Research (CSIR) has announced the result of Joint CSIR-UGC National Eligibility Test (NET) 2018 for December session on April 3, 2019. Candidates who appeared in the Joint CSIR-UGC JRF/NET Exam held on December 16, 2018, can now check their results from the official website.The CSIR-UGC JRF/NET December exam has been released int he PDF format where the roll numbers of the successful candidates are mentioned. The candidates whose roll numbers are listed in the PDF document have qualified in the test for JRF-NET. These candidates are also eligible for Lectureship-NET subject to their fulfilling criteria for lectureship as laid down by UGC. The Fellowship will be effective from July 1, 2019. The validity of the result will be of two years for joining the fellowship under CSIR UGC NET scheme. According to the data available on the official website, a total of 1969 candidates have qualified for JRF (NET) while 67 candidates have qualified for JRF only. For Lectureship, a total of 1500 candidates have qualified. Two separate merit lists - candidates qualifying for JRF-NET and those qualifying for Lectureship (LS-NET). Shortlisted candidates are eligible for Junior Research Fellowship (JRF) and Lecturership-NET. CSIR UGC NET December 2019 result released at csirhrdg.res.in: The Council of Scientific & Industrial Research (CSIR) has declared the UGC-NET 2019, June examination result on its official website. The result is now available on the official website of the CSIR - csirhrdg.res.in. The candidates who appeared for the examination can visit the official website of CSIR to check their respective results. The CSIR UGC NET 2019 examination was held on December 16, 2018. A total of 1,991 candidates have been selected for the Junior Research Fellowship (NET) CSIR and 1,500 candidates have been selected for Junior Research Fellowship (NET) UGC. A total of 3,756 candidates have qualified the Lecturer (NET) post. The candidates will get fellowship from July 01, 2019, and will be valid for 2 years joining the CSIR fellowship. The CSIR UGC-NET exam is held twice a year - June and December. The CISR UGC NET December 2019 exam will be conducted on December 16, 2018. Joint UGC CSIR NET results have been released on the official website of the exam. Candidates who have appeared for the CSIR NET or CSIR UGC NET 2019 exam may check their results on the official website or after clicking the website link given in this article. According to CSIR, the Fellowship will be effective from July 1, 2019. Council of Scientific & Industrial Research (CSIR) s Human Resource Development Group (HRDG) has released the CSIR UGC NET December results on the official website, csirhrdg.res.in. Step 1: Go to the official website of CSIR as mentioned above. 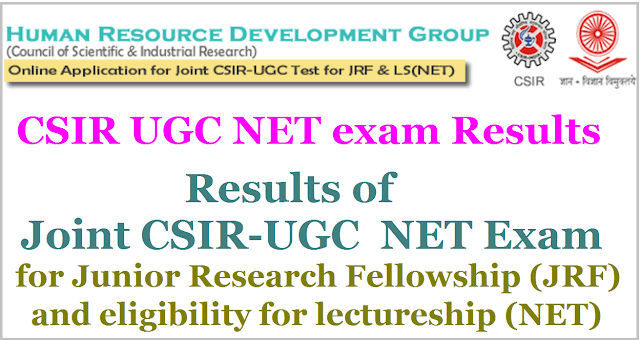 Step 2: Click on the link that says “JOINT CSIR-UGC NET Exam June 2019 Result”. Step 3: Scroll down the PDF to check your roll number and rank. Step 4: Download your result and save a copy of the same for further reference. The candidates whose roll numbers are listed in the results have qualified in the test for JRF-NET. These candidates are also eligible for lecturership-NET subject to their fulfilling criteria for lecturership as laid down by UGC , said the results notification from CSIR. Candidates can check the CSIR NET December 2019 result using their roll number. CSIR has released the result in a .pdf format. CSIR has also released cut offs individual subjects. The cut off for JRF is higher than it is for Lectureship. For instance, in physical science subject the cut off for general category is 40.63% while it is 36.57% for lectureship in the same category. ‘Ranks are allotted first to all successful candidates qualifying for Junior Research Fellowship as per the merit list of JRF and then the candidates are distributed between CSIR and UGC in the ratio of number of fellowships shared between these two for each subject except Bachelor’s degree holder’s who are allocated to CSIR,’ reads the official notification. Step 2: Click on the link that says “JOINT CSIR-UGC NET Exam December 2019 Result”. As per the exam authority, the ranks are allotted first to all successful candidates qualifying for Junior Research Fellowship as per the merit list and then the candidates are distributed between CSIR and UGC in the ratio of number of fellowships shared between these two for each subject. CSIR Results: The council will not issue any separate intimation letter about the results. The Council shall not be responsible for any printing error in the publication. No separate intimation letter shall be issued. The result has been finalised only after addressing all the queries/representations received from the candidates till stipulated date. 3) Final mark sheet with the required percentage of marks (iv) caste certificate, if applicable. 4) Copy of CSIR marks statement. OBC(Other Backward Class) candidates will have to submit their latest caste certificate (non-creamy layer) as per the format given on www.ncbc.nic.in. Physically and visually handicapped candidates will also have to submit the certificate as per government of India rules. Candidates are required to send the above mentioned documents by Registered/Speed Post to Section Officer, Certificate Section, HRD Group, CSIR Complex, Library Avenue Road, Pusa, New Delhi - 110012. The candidates while sending their documents must super-scribe on the envelop "Documents for June 2019 NET Exam" with Roll Number and the slot they have been allotted as CSIR JRF/UGC JRF/LS. Write “Documents for /June /December 2019 NET Exam” on top of the envelope with roll number and the slot allotted as CSIR JRF/UGC JRF/LS. Send your documents by Registered/Speed post to Section Officer, Certificate Section, HRD Group (CSIR), CSIR Complex, Library Avenue Road, New Delhi - 110012.